NEW YORK—To all those who think that illustrating a children’s book is child’s play, the Society of Illustrators challenges you to think again. “Children are the harshest critics,” said Marcia Leonard, advisor to the Society’s annual exhibition showcasing the works of fine art that become children’s books. “If a child doesn’t like the pictures, the book flies across the room, and it goes unread. But if the child likes it, it becomes a favorite, and it will be the parent who hides it under the bed, so they don’t have to read it for the millionth time,” she said. 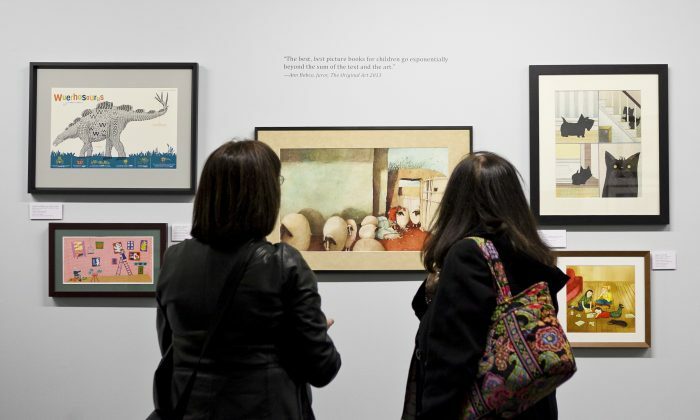 Titled “The Original Art,” the exhibit highlights the fact that before illustrations become beloved picture books, they are first born as pieces of fine art—oil paintings, intricate paper cuts, collages, mixed media masterworks. All of these mediums and more are shown in this year’s exhibit. Without such an exhibit, the public wouldn’t get to see this art. When Leonard started the exhibition with illustrators’ agent and art director Dilys Evans in 1980, publishers didn’t get the concept. She said they practically had to beg publishers to participate. But once the exhibition went up, the lightbulbs went off. Since then, the exhibition has been growing. In the last two decades or so, it has been hosted by the Society, whose work has long demonstrated the intersection between fine art and illustration. Each year the open call is made to publishers to submit children’s books—everything from cardboard tomes for tiny tots to graphic novels for young adults. A huge volume of books pour in. What takes place next is what one juror described as “speed dating without the bar tab”—each juror, who is usually an artist and sometimes an editor, sits at a table in the Society’s upstairs restaurant with a stack of books. They review each one silently, looking at the pictures without reading the words. They’re asked to keep an open mind about artistic style, and cast votes based solely on skill, stylistic consistency, and storytelling power. No one knows how anyone else votes. Artists whose books win unanimous votes from the eight jurors are invited to send in their original artwork for the exhibit. This year’s exhibit represents the work of 125 artists. The media are diverse and the styles—from sweet to zany to wildly imaginative—are even more so. Visitors are welcome to browse the books on display from which the illustrations come and see how the images interact with, enrich, and support the text. Leonard has seen several trends in the children’s book arena in her years working on this exhibit. “There’s so much pressure on publishers now, with the electronic publishing,” said Leonard. But until the mass-market color e-book becomes feasible for parents, printed children’s books will still dominate, she said. Children’s book illustrations have become more sophisticated over the years, she said. Gone are the days when artists thought cute woodland creatures suffice. “People who do work for adults are now interested in creating books for children. They are like a very sophisticated haiku,” she said. They are more willing to take on heavy topics too. This year’s Founder’s Award, given to an illustrator who has not published more than three books, went to Yuko Shimizu for “Barbed Wire Baseball,” a book about Japanese internment during World War II. Children’s books have been getting a lot of attention lately. The New York Public Library has its exhibit, The ABC of It: Why Children’s Books Matter and recently released a list of 100 great children’s books.